Periodontal surgical procedures by their nature carry with them an attendant risk of developing complications, one among which includes infection. Various antiinfective measures have been advocated to improve clinical outcomes following postsurgical intervention. , These measures include: (1) Meticulous professional mechanical debridement, (2) application of antiseptics in dressings and/or rinses, and (3) administration of systemic antibiotics. The value of optimal plaque control (mechanical debridement) as a prerequisite for successful treatment outcomes is well-documented. , Furthermore, studies have established the key role of chlorhexidine (CHX) digluconate rinses in favorable healing responses following surgery. In contrast, the routine use of perioperative/postoperative antibiotics in anticipation and prevention of postoperative infection appears for the most part to be based on empiricism and unsubstantiated. Furthermore with increase in use of bone grafts, guided tissue regeneration (GTR) membranes and implants, the use of antibiotics have further increased. This is all the more significant in our current era of periodontal practice where concerns are continuously raised about the overuse and side-effects, including the emergence of antibiotic-resistant bacterial strains. To determine the actual rates of postsurgical infections and those factors, which may affect infection rates?. A prospective randomized cross over clinical trial was carried out in 70 individuals selected from outpatient Department of Sri Hasanamba Dental College and Hospital, Hassan for a period of 1 year from October 2011 to October 2012. The research protocol was approved by the Ethical Committee and Review Board of Sri Hasanamba Dental College and Hospital, Hassan. Verbal and written informed consent was obtained from all the subjects participating in the study. Patients requiring any periodontal surgery with no history of antibiotics in the 6 months preceding the start of the study were included. Patients with systemic diseases or conditions (ASA2 and above) that affect healing and those requiring prophylactic antibiotics when there is a medical condition (heart valve replacement, rheumatic fever etc.) and with a full mouth plaque score <20% were excluded. Following completion of Phase 1 therapy consisting of oral hygiene instructions and scaling and root planning, 70 patients were enrolled in the study. Participants were randomly assigned to any of the following three groups by lottery method. Prophylactic antibiotic (1 g amoxicillin 1 h before the surgery). No antibiotics were given postoperatively. Only analgesics and antiseptic mouth wash were prescribed (n = 31 sites in 23 patients). Therapeutic antibiotics were prescribed. Amoxicillin 500 mg tid for 5 days after surgery. Analgesics and antiseptic mouth wash were also prescribed (n = 35 sites in 25 patients). No antibiotics given either prophylactically or postoperatively. Only analgesics and antiseptic mouth wash were prescribed (n = 34 sites in 22 patients). Periodontal surgeries were carried out in 100 sites in 70 patients. Surgical procedures performed were open flap debridement, osseous resective surgeries, distal wedge procedures, regenerative therapy (bone grafting), mucogingival surgeries (coronally advanced flap, free gingival grafting (FGG), free connective tissue grafting,) frenectomy, and crown lengthening with or without ostectomy. All the surgical procedures were carried out by postgraduates in the department. When a patient was planned for a full mouth surgery, the same patient was subjected to different regimens (prophylactic, no antibiotic, or postoperative antibiotics). Smokers were asked to at least refrain from smoking until the day of suture removal. All the examinations were done 1 week after surgery on the day of suture removal. The clinical parameters were recorded by an examiner who was masked to the treatment received, whereas another clinician carried the surgery and provided the treatment in all the three groups. Patients were evaluated for pain, both immediate and progressive (measured on visual analog scale [VAS]), swelling, fever, delayed wound healing and any other significant findings. Any adverse effects due to the drug administered and patient compliance for the drug was also noted [Table 2] and [Table 3]. Subjects were instructed to report if any increased or progressive pain and swelling occurred 48-72 h postsurgery. Any other unscheduled return in which the provider placed a patient on antibiotic therapy after surgery was also considered as an infection. The subjects were monitored for 1 month after surgery for any delayed complications. 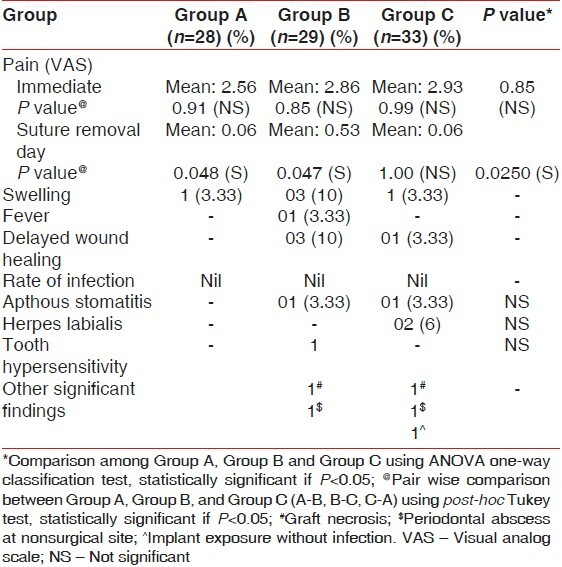 The data collected were examined to determine if there was any relationship between the prevalence of postoperative infection and treatment variables such as number of surgeries per patient, type of surgery, size of surgical site, operator's skill and experience, use of bone grafts, soft tissue grafts, and smoking. A total of 100 surgeries were carried out in 70 patients during the study. Three patients in Group A and 1 patient in Group C failed to follow-up. Six patients in Group B were discontinued from the trial as GTR was placed during the surgery. A total of 90 sites in 60 patients were analyzed (Group A, n = 28, Group B, n = 29 and Group C, n = 33). Males (54%) were more affected than females (46%). There were two smokers each in Group A and B and three smokers in Group C who participated in the study. Surgical procedures carried out were periodontal flap, bone grafting, crown lengthening, osteoplasty and mucogingival surgeries. The most common surgical procedures performed were periodontal flap. Parameters like pain (immediately postsurgery and on the day of suture removal on VAS consisting of 0-10 scale), swelling, fever, delayed healing, apthous stomatitis, and postoperative infection were measured all on the day of suture removal. All patients reported mild to moderate pain immediately after surgery and no pain on the day of suture removal. There were no clinical and statistical significant differences between the three groups. However, 2 patients reported less pain during the surgery when prophylactic antibiotics were given [Table 3]. Three patients in Group B and 1 each in Group A and C reported mild swelling for 2 days after surgery. One patient in Group B also complained of fever postoperatively. 3 patients in Group B and 1 patient in Group C had delayed wound healing. 1 patient each in Group B and C also had apthous stomatitis and 2 patients in Group C had herpes labialis postoperatively. No Infection was reported in any of 90 sites. However, 1 patient each in Group C and B developed periodontal abscess at nonsurgical site on the day of suture removal. The abscess was drained and healing was uneventful the week after. Graft rejection was reported in 2 patients (Group B and C category) [Table 4]. There was no statistical significant difference in the incidence of infection following flap surgery with grafting and that recorded after flap surgery without grafting in all the three groups. Bone grafts materials used included allografts and xenografts. In the same patient, there was no statistical significant difference in the incidence of infection whether or not bone graft was placed or osseous surgery was performed. Systemic antibiotics are used as an adjunct to periodontal surgery in specific disease profiles (aggressive/refractory/smokers) for more aggressive treatment, in anticipation and prevention of postsurgical infections, and in periodontal surgery aiming for regeneration. Routine use of systemic antimicrobials following periodontal surgery is not justified as the prevalence of postoperative infections is <1%. The rationale of using antibiotics with regenerative procedures is to increase the predictability of results by controlling the subgingival microflora in order to reduce the risk of postoperative infection. Studies conducted by Demolon et al., , Loos et al.,  have concluded that use of antibiotic may have helped to control initial inflammation, but had no direct effects of clinical significance on bone regeneration or soft tissue attachment at 12 months. There was no infection seen in any of the 90 sites operated in all the three groups (0%). Use of bone grafts was not associated with the statistically significant change in postoperative infection rate. Smokers too did not show any infection when compared to nonsmokers. The results are favorable or even superior to previously conducted retrospective studies ,,,, that have reported infection rates ranging from <1% to 5.4% and attests the observation that periodontal procedures performed to modern standards by various operators carry a low risk of developing postoperative infections. This was a prospective study, where the surgical procedures were performed by the postgraduates with a standard protocol and strict asepsis, on systemically healthy patients with no signs of immunosuppression. These are the few reasons for the superior results when compared with other similar studies. Powell et al. in their study reported that 18 of the 22 infections (82%) occurred following surgery by general dentists and residents when compared with 4 (22%) performed by board certified periodontal faculty members. Similar to our study, Pack and Haber (1%)  and Gynther et al. (4%)  too reported low prevalence of postoperative infections when multiple operators performed the surgeries in a large institutional setting. This is in contrast to the study by Checchi et al. who reported slightly higher incidence of complications. The difference is possibly due to different operative conditions, with regard to number of surgeons (single vs. multiple) and different health care environment (dental school vs. private office setting). It is clear from the above data that proper tissue manipulation and good clinical technique are more important factors in protection of patients from postoperative infections. Various studies characterized infection differently, ,, postoperative infection in the current study was defined as increasing and progressive soft tissue swelling with the presence of suppuration. Fever and lymphadenopathy were not absolute requirements for classification of infection. Despite the lack of exact agreement on what constitutes a clinical infection, the reported prevalence of infections in all of them is similar. Delayed healing was reported in 4 (4.44%) of all patients, three being in antibiotic group (10%). Neither of these patients was smokers nor was grafting performed in any of these cases. There was no relationship between type of procedure performed and infection rates in our study, However free gingival autografts showed higher postoperative complications. 2 of the total 5 cases reported complete necrosis of the graft. This is similar to the large retrospective study conducted by Powell et al. and Pack and Haber  who reported higher infection rates following epithelialized free soft tissue autografts, guided bone regeneration and enamel matrix derivative. Measurement of pain and swelling is extremely difficult and tends to be subjective. In the present study, Pain was evaluated by VAS. Patient experienced slightly higher pain when bone grafts were used and mucogingival surgeries were performed when compared with other surgeries. This is similar to studies conducted by Curtis et al.,  and Matthews and McCulloch  who reported that mucogingival surgeries and osseous surgeries were associated with an increase of 3.5 times more pain and discomfort than other periodontal surgeries. Longer duration of surgery and bone exposure resulting in excessive postoperative inflammatory response may be the two reasons that increase postoperative pain and discomfort in these surgeries. Furthermore when intergroup comparisons were made, the pain was similar in both Group B and C, but subjects experienced less pain when prophylactic antibiotics were given. All the other inflammatory parameters (swelling and delayed healing) were less in Group A (statistically insignificant) compared to Group B and C, which were similar. All patients were given topical CHX postoperatively. Clinical and experimental evidence seems to suggest that CHX enhances wound healing, reduces complications and improves clinical parameters following periodontal surgery. ,, However, it is not possible to determine to what extent and under what conditions CHX may have contributed to reduction in infection. Further studies are needed to assess whether CHX may be given in selected cases as an effective substitute for systemic prophylactic antibiotics. Within the limits of the study, we confirm previous research demonstrating low rate of infection following periodontal surgical procedures. There was no infection reported in all the 90 cases operated in our study. The prevalence of postoperative infections following periodontal surgery is <1% and this low risk does not justify the use of systemic antimicrobials just to prevent infections. Antimicrobials are powerful agents when used in well-focused ways. They should be held in reserve for treatment of certain forms of advanced periodontal diseases (refractory, aggressive), in systemically compromised individuals with a reduced host response and in treatment of postsurgical infections. The other reasons can be when surgery is performed in an infected site, when the procedure is extensive taking >2 h or when large foreign materials are implanted. Various retrospective and prospective controlled studies have further reported no benefit seen from the use of antibiotics even in low to moderate risk dental implant patients. , Hence, it is important that the dental profession diligently consider its responsibility to curb the use of unnecessary antibiotics and keep antibiotic efficacy high for when they are truly necessary. Various other factors are more important in protecting the patient from postoperative infections. They include aseptic protocol, skill and experience of surgeon, tissue manipulation and surgical technique, duration of surgery and control of systemic and local risk factors with increased susceptibility to infections. Hence, use of antibiotics should be based on procedural outcomes and should not be generalized or used blindly just to be extra cautious in preventing infection. Therefore, we suggest more double-blind clinical trials to be conducted to examine the role of antibiotics in prevention of postsurgical infections. 1. Nyman S, Rosling B, Lindhe J. Effect of professional tooth cleaning on healing after periodontal surgery. J Clin Periodontol 1975;2:80-6. 2. Rosling B, Nyman S, Lindhe J. The effect of systematic plaque control on bone regeneration in infrabony pockets. J Clin Periodontol 1976;3:38-53. 3. Westfelt E, Nyman S, Lindhe J, Socransky S. Use of chlorhexidine as a plaque control measure following surgical treatment of periodontal disease. J Clin Periodontol 1983;10:22-36. 4. Stahl SS, Soberman A, De Cesare A. Gingival healing. V. The effects of antibiotics administered during the early stages of repair. J Periodontol 1969;40:521-3. 5. Ariaudo AA. The efficacy of antibiotics in periodontal surgery: A controlled study with lincomycin and placebo in 68 patients. J Periodontol 1969;40:150-4. 6. Kidd EA, Wade AB. 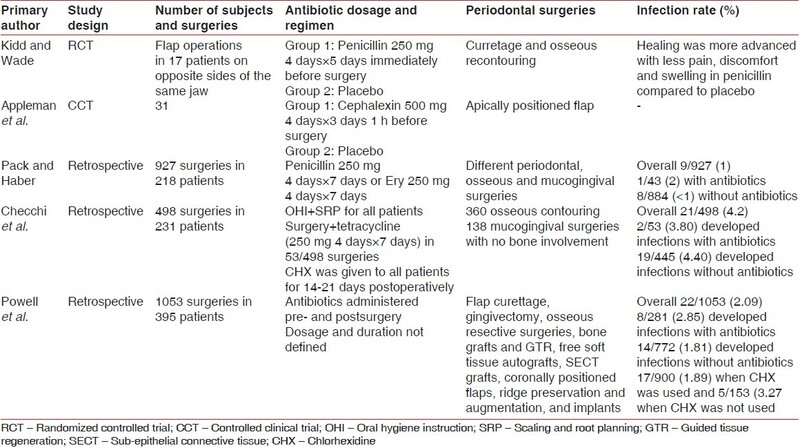 Penicillin control of swelling and pain after periodontal osseous surgery. J Clin Periodontol 1974;1:52-7. 7. Cortellini P, Bowers GM. Periodontal regeneration of intrabony defects: An evidence-based treatment approach. Int J Periodontics Restorative Dent 1995;15:128-45. 8. Machtei EE, Schallhorn RG. Successful regeneration of mandibular Class II furcation defects: An evidence-based treatment approach. Int J Periodontics Restorative Dent 1995;15:146-67. 9. Dent CD, Olson JW, Farish SE, Bellome J, Casino AJ, Morris HF, et al. The influence of preoperative antibiotics on success of endosseous implants up to and including stage II surgery: A study of 2,641 implants. J Oral Maxillofac Surg 1997;55:19-24. 10. Laskin DM, Dent CD, Morris HF, Ochi S, Olson JW. The influence of preoperative antibiotics on success of endosseous implants at 36 months. Ann Periodontol 2000;5:166-74. 11. Checchi L, Trombelli L, Nonato M. Postoperative infections and tetracycline prophylaxis in periodontal surgery: A retrospective study. Quintessence Int 1992;23:191-5. 12. Pack PD, Haber J. The incidence of clinical infection after periodontal surgery. A retrospective study. J Periodontol 1983;54:441-3. 13. Appleman MD, Sutter VL, Sims TN. Value of antibiotic prophylaxis in periodontal surgery. J Periodontol 1982;53:319-24. 14. Powell CA, Mealey BL, Deas DE, McDonnell HT, Moritz AJ. Post-surgical infections: Prevalence associated with various periodontal surgical procedures. J Periodontol 2005;76:329-33. 15. Gynther GW, Köndell PA, Moberg LE, Heimdahl A. Dental implant installation without antibiotic prophylaxis. Oral Surg Oral Med Oral Pathol Oral Radiol Endod 1998;85:509-11. 16. Ahmad N, Saad N. Effects of antibiotics on dental implants: A review. J Clin Med Res 2012;4:1-6. 17. Demolon IA, Persson GR, Ammons WF, Johnson RH. Effects of antibiotic treatment on clinical conditions with guided tissue regeneration: One-year results. J Periodontol 1994;65:713-7. 18. Demolon IA, Persson GR, Moncla BJ, Johnson RH, Ammons WF. Effects of antibiotic treatment on clinical conditions and bacterial growth with guided tissue regeneration. J Periodontol 1993;64:609-16. 19. Loos BG, Louwerse PH, Van Winkelhoff AJ, Burger W, Gilijamse M, Hart AA, et al. Use of barrier membranes and systemic antibiotics in the treatment of intraosseous defects. J Clin Periodontol 2002;29:910-21. 20. Curtis JW Jr, McLain JB, Hutchinson RA. The incidence and severity of complications and pain following periodontal surgery. J Periodontol 1985;56:597-601. 21. Matthews DC, McCulloch CA. Evaluating patient perceptions as short-term outcomes of periodontal treatment: A comparison of surgical and non-surgical therapy. J Periodontol 1993;64:990-7. 22. Heitz F, Heitz-Mayfield LJ, Lang NP. Effects of post-surgical cleansing protocols on early plaque control in periodontal and/or periimplant wound healing. J Clin Periodontol 2004;31:1012-8. 23. Lambert PM, Morris HF, Ochi S. The influence of 0.12% chlorhexidine digluconate rinses on the incidence of infectious complications and implant success. J Oral Maxillofac Surg 1997;55:25-30. 24. Hamp SE, Rosling B, Lindhe J. Effect of chlorhexidine on gingival wound healing in the dog. A histometric study. J Clin Periodontol 1975;2:143-52.